The relatively new management team at global income investment trust Scottish American Investment Company (SCAM) have high standards to meet given its impressive 38 years straight of dividend growth. Scottish American’s approach is long-term and concentrates on identifying cash generative companies capable of paying dependable and growing dividends that will beat inflation. Yet the trust – also known as SAINTS – stands apart from many other income funds by being prepared to be different, straying from typical global equity income benchmark names in favour of better opportunities. The trust aims to deliver total returns of 8% annually over the investment cycle, roughly split as 5% from capital and 3% from dividends. 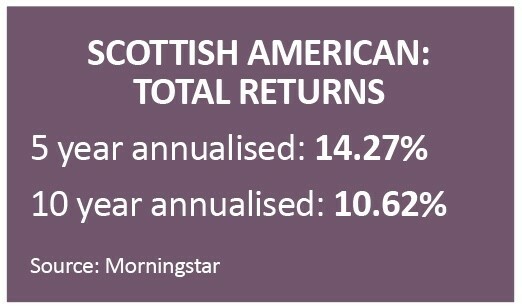 Performance over the past five years has been significantly better than that target, with Scottish American’s share price rallying from 232.5p to 372.5p now. That averages out at 12% a year capital gains, which can be added to the 2.5% a year average income increase since 2012. Net asset value (NAV) has grown more than 60% since 2014 which is a very decent performance. As is common to all Baillie Gifford funds, investment decisions are research-based. The managers are also able to draw on the deep well of shared experience and expertise across the Baillie Gifford team which means drawing from the best in-house ideas. This includes opportunistic, if limited, fixed income assets and strategic UK property investments, the latter outsourced to specialist investment manager Olim. But bonds and property are really just a sideline to the main global equities approach, where German stock exchange operator Deutsche Borse, Coca Cola and insurer Prudential (PRU) are key holdings at present. Ongoing charges of 0.8% are competitive while the annual dividend, paid in quarterly chunks, yields 3% on an historic measure. Want to know more about Scottish American Investment Company? Come to Shares’ investment trust event in London on 3 July where fund manager James Dow will be giving a presentation and taking part in a panel discussion. Could post-Brexit M&A rules deter foreign investment? What could more liberal cannabis laws mean for investors? Are investors underestimating Costa’s growth prospects in China? Should you panic if there is a profit warning soon after a stock market listing? Should I pay for expert financial advice on my pension?